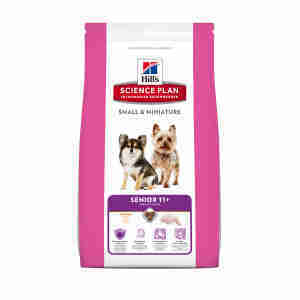 Science Plan Canine Senior 11+ Small & Miniature is made with the highest quality ingredients and has been created with the right nutrients and vitamins to ensure a happy and healthy life. Hill’s Science Plan Canine senior 11 + Small & Miniature is has been especially tailored for your dog that is reaching his senior years and is a small or miniature breed. All breeds, ages and sizes require different nutritional needs. Science Plan Canine Senior 11+ Small & Miniature with Chicken is a complete food with controlled levels of protein, fat, phosphorus and sodium. With no artificial preservative, flavours or minerals. vegetable oil, sh oil, minerals, dried beet pulp, axseed, tomato pomace, citrus pulp, grape pomace, spinach powder. 690mg, Vitamin C 105mg, Beta-carotene 1.5mg, L-Carnitine 304mg. (Manganese) 10.7mg, E6 (Zinc) 206mg, E8 (Selenium) 0.5mg, with natural antioxidant.